The camera locks in on a character we’ve presumed dead. Their eyes are closed, they’re not breathing—all onscreen vital signs point to negative. But the camera’s holding on the body, so the filmmakers are building anticipation for something. With or without a zoom, it’s a visual shorthand for “Closer. Come closer…” Finally, the tension breaks, the inevitable occurs, and the corpse opens its eyes. Cut to black. It’s a tired old trick, and if you want to see it handled poorly, watch the best episode of Mystery Science Theater 3000’s Sci-Fi Channel seasons, Space Mutiny. The film featured in the episode ends with a POV shot that meanders its way toward the charred remains of the villainous Kalgan, last seen perishing in the fiery collision of two bumper cars. The dead air of the sequence leaves a wide berth for Mike Nelson and his robot friends, whose incredulous comments about the sequence eventually give way to pleas for the sweet release of Kalgan’s eyelids retracting. Now, I’m not saying that I greeted the image of a submerged Milan with frustrated cries of “Aaaaand his eyes open,” but I also can’t watch a sequence like the one at the end of “Madame Costa” and not think about Space Mutiny. Once someone exposes the wires of a trick like that, I can’t un-see them; from the moment the scene shifted from Julie’s ransacked apartment to Milan’s watery surroundings, the ending of the episode came to me with Victor-like clarity. The Returned reaching for a cliché like that would lower my opinion of “Madame Costa” if Milan’s awakening was an isolated incident. But it’s not: The whole show revolves around awakenings; Milan’s is the third of three literal awakenings depicted in this week’s episode. He follows Victor, who shoots out of bed following a quick-cut montage showing a squalid stairwell, a wall of revenants, a bunker-like stronghold, and Julie’s flying leap into the unknown. Later in the episode, Victor’s father (well, Louis’ father—but he’ll always be Victor to me) is roused from his coma, making good on the signs of life Julie thought she saw when she visited his hospital room. The episode’s title character also participates in something of an awakening. Of those who returned in the first season, Madame Costa was the only one whose cause of death remained a mystery. It’s given her some additional mystique, but it’s also made her the show’s most thinly drawn revenant. 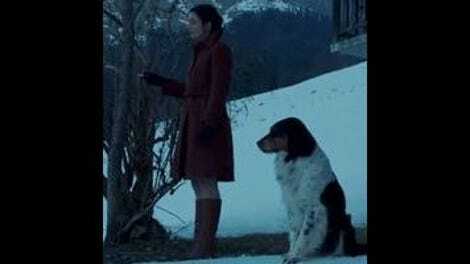 She was the first we were aware of (you can hear her knocking at the door before Camille comes out of the mountains in the series premiere) but the last to die onscreen, and her quick and unceremonious end on the frozen lake is fitting at this juncture. It’s only depicted in “Madame Costa” in order to clarify a larger point about Victor and season two: The accuracy of the boy’s drawings and their proximity to the tragedies illustrated therein. Further softening the blow of the episode’s parting shot: The past few episodes of The Returned have been all about opening eyes. Our understanding of what’s happening in this town remains foggy, but we’ve never been more aware of what’s happening there. Thanks to the discovery they made last week, Jérôme and Berg have connected nearly every catastrophe of the past 35 years to one of Victor’s drawings. But some question marks remain, tacked to the most disturbing images in the collection: The vision of a man being devoured by wolves and the multi-party shootout in the woods. (There’s also a question mark next to the likeness of Serge, probably because Toni didn’t tell anyone about cleaning up that little mess.) This, coupled with the government’s discovery of tunnels beneath the lake, provides us with more information about The Returned than we’ve ever had before. But “Madame Costa” likes to shed new light to cast new shadows. Virgil is typically a fount of knowledge when it comes to matters of life after death, but his responses about Esteban’s sudden transformation are elliptical at best. (“Will we become like him?” “We are like him.”) In his encounter with Lucy, Alcide asks why she needs to find baby Nathan; Lucy cryptically replies “Without him, I won’t find the way.” (Shades of Simon’s parents last week: “We joined the circle. We found the way through.” Is “the circle” the woodland shootout in Victor’s drawings?) As much as it feels like every new episode of season two arrives with a Bankers Box stuffed with evidence, there’s still a lot of mystery to this show. Episodes like “Madame Costa” emphasize plot over mood, but they draw me into the show’s tangled web as effectively as any of season one’s atmospheric installments. I’ve been wrestling with this since “L’enfant,” and “Madame Costa” really cinches it: Season two of The Returned is a different type of show than season one of The Returned—and that’s not a problem. I find myself valuing different elements of “Madame Costa” or “L’enfant” than I would if they’d aired in sequence with “Camille” or “Adèle.” The story is accelerating in such a way that it can’t slow down to linger on a character’s grief, nor can it allow their emotional reaction to these strange circumstances to wash over an entire episode. Take Adèle and Simon’s efforts to hide Nathan from Lucy (and the authorities that would unwittingly put the baby in Lucy’s hands). When the cast of characters was smaller, and the world of the show more constricted, this could’ve been an episode’s primary storyline. But here it’s a small piece in a much larger puzzle, a vehicle for episodic suspense that also ratchets the season-long tensions between Lucy’s grand plans and Simon’s desire to reunite with his family. Julie’s homecoming is put to similar use, her loneliness and disorientation packing an emotional punch, while her homecoming serves the narrative function of a) introducing Mr. Lewanski, and b) confirming Laure’s death in the Gendarmerie massacre. 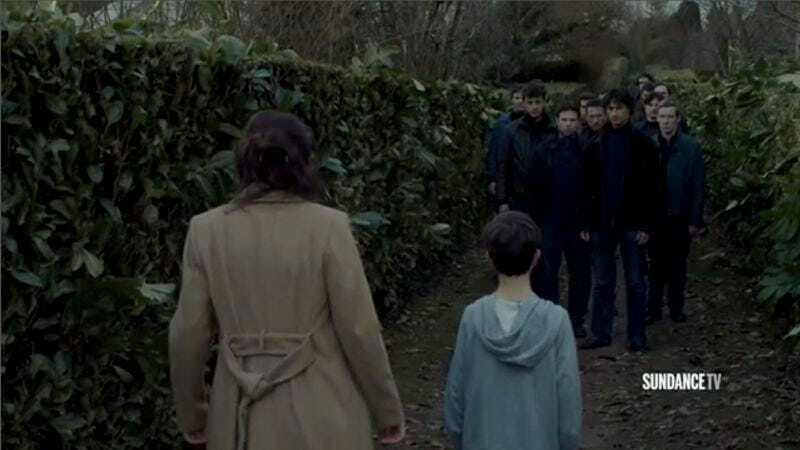 It’s all of a piece with The Returned’s increased use of conventions and tropes like Milan’s Kalgan moment at the end of “Madame Costa,” a progression toward handling its increased volume of ongoing stories (and its deepening mysteries) like a traditional television program. It’s an increased commitment to narrative that never loses sight of what made this show feel so fresh and so novel in its first season. The feeling of loss and the hope of rebirth are still communicated affectingly, be it through Camille’s confusion about Esteban or Audrey’s rough post-return transition. While most of the people around her adjust and acclimate to this changed world, Audrey experiences a concentrated dose of the shock that Camille experienced before. Only, since these events have been occurring for six-plus months, her reunion with her mother has a different, more tragic outcome. All the time that’s passed has allowed for a variance in the way the living greet their returning loved ones. Audrey’s capture deploys another well-worn scare tactic: Speaking with her daughter for the first time in years, Sandrine keeps her back to the entrance, with Constance Dollé blocked in such a manner that another character could easily darken the doorway—and one soon does. It Follows proved that there’s still plenty of life left in this device, and The Returned follows suit, using the plastic tarp to blur the figure’s identity, making Pierre and The Helping Hand gang seem ever more monstrous. And so The Returned opens its eyes once more, only to find that the nightmare keeps going when it’s awake. Why does Victor draw? To get the horrible images out of his head? Or, because he wouldn’t remember otherwise? I always forget that memory is as important to this show’s thematic core as grief or renewal are.